One of the main characteristics about the landscape in Northern Vietnam are the terraced rice fields. 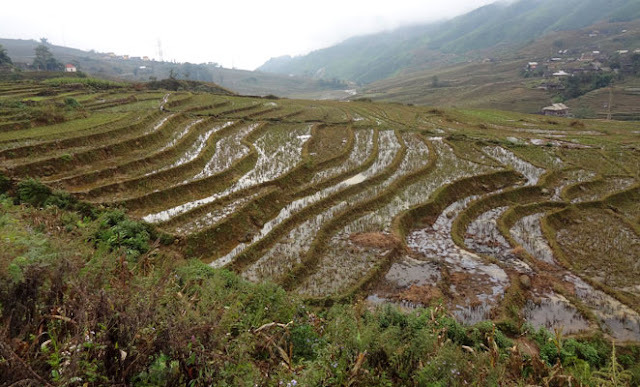 The irrigation works around Sapa (North Vietnam) extend like huge flights of steps far up along mountainsides. These terraced fields have been built since antiquity and maintained at a extraordinary cost in human labor and toil. 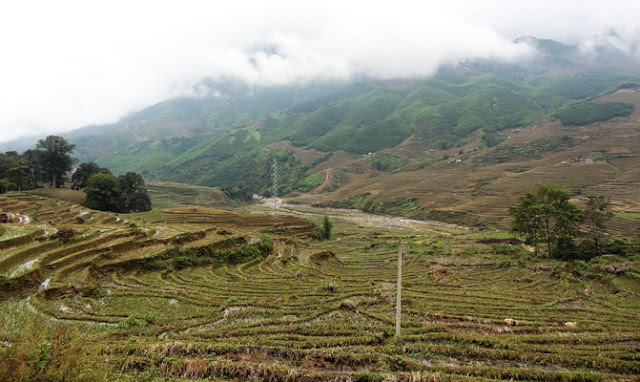 As we trekked around the mountains and down in the valleys, we could see these terraced fields for as far as we could see. 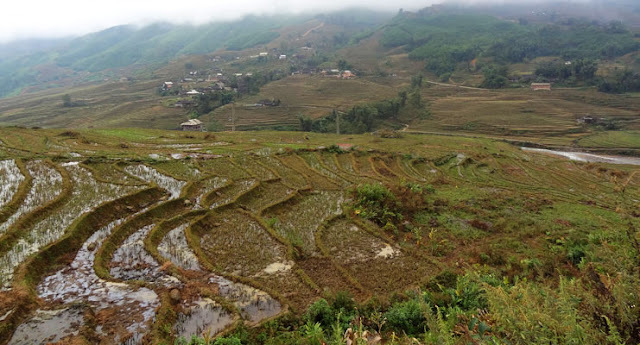 The hill tribes around Sapa are subsistence farmers who live off their land and the livestock they own. They do not pay taxes, but they also do not receive any government pensions or other social services. 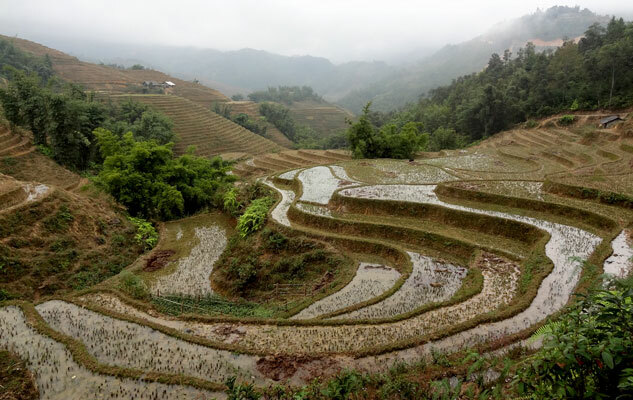 They grow rice for their families, which is backbreaking labor and in a bad season the land does not provide enough rice to feed them. In that case the Vietnamese government helps by distributing 300kgs of rice per family to the villages. 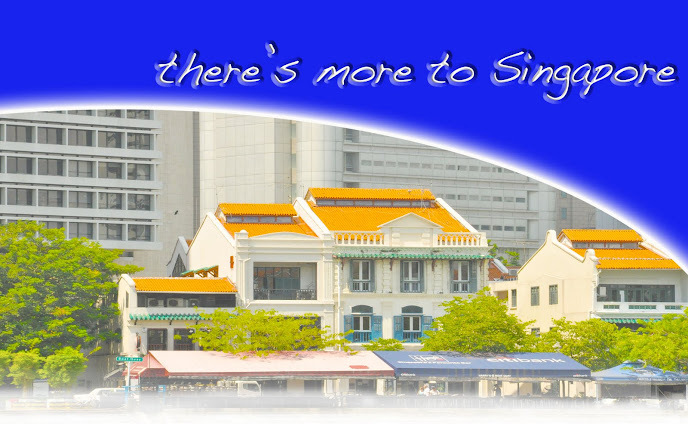 Terrace building and water control, reputedly the "eighth wonder of the world," is a distinctive cultural phenomenon of Asia. 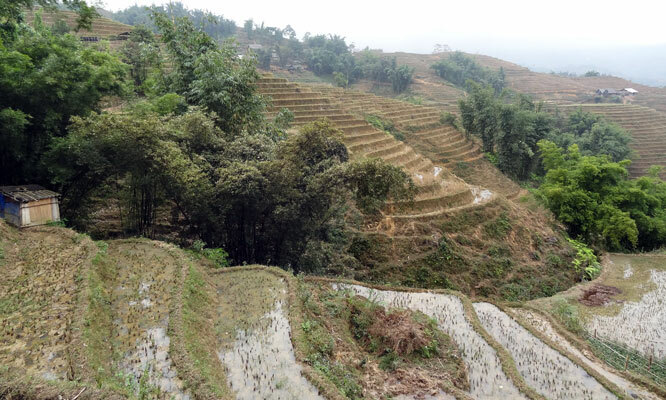 Terracing, as done in many parts of Asia, consists of building stone walls, often without mortar, along the slope and contours of uplands being converted into cultivated land. The walls might be given a slight batter (receding upward slope) or inward lean at the top. These walls often exceeded six meters in height and were topped with sluices for water drainage. Earth materials would then be used to fill each unit to a level just below the top of the wall. 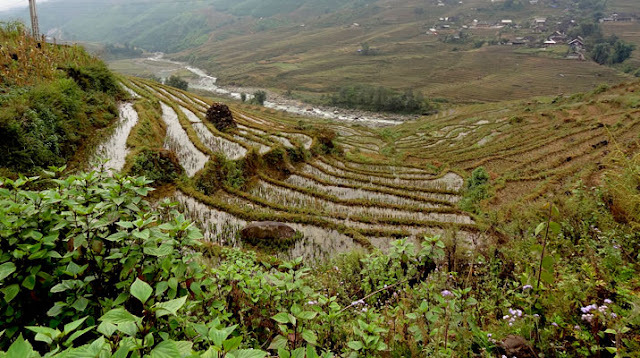 By then staggering the field units in overlapping manner at different levels, a whole mountain slope might be terraced toward the top such that it resembled a sculptured system of fields covered with rice and other types of crops. The field units may be as narrow as 2.5 meters but as long as 90 meters on steep slopes. They are, however, commonly much wider and not so long. For irrigation, water is usually introduced at the top of a terrace series or sometimes as a complementary supply at an intermediate point. The water that is supplied then moves through sluices in each field by gravity downward across each level of the terrace. Finally, the water empties into a stream channel at the bottom of the valley. 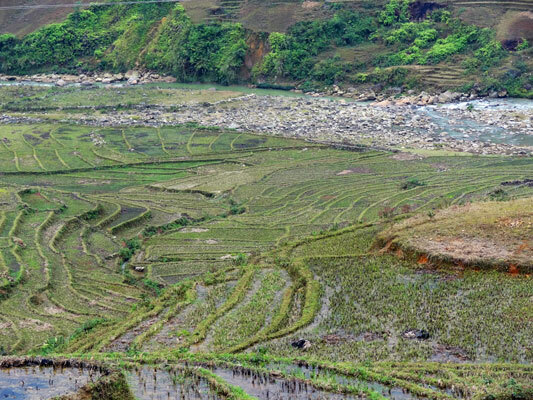 The terraced rice fields of Vietnam are an amazing sight. This is not a place to rush any journey, you do need the time to stop and absorb what is around you! JOHN FABRE with the Sony Cybershot. 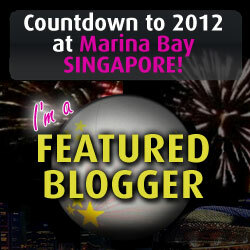 Blog posting on the Magical Dinner! This is just one of the many blog posts of our visit to Hanoi and beyond.